Time of Birth - In Judaism the day begins at nightfall, so in order to determine the exact date of your Jewish birthday we need to know what time of day you were born. No Membership is necessary to attend Chabad Hebrew School. Tuition for a full year of CHS (August, 2018- May 2019) is $500.00. For multiple siblings and members, we offer an additional 10% off. In addition, all registrations received with a first payment by July 24th, 2018 will be eligible for a $50 early bird discount. Tuition for the Pre K 4 class is $225.00. All registrations received with a first year payment by July 24th, 2018 will be eligible for a $25 early bird discount. Please choose one of the following payment plans. If you would like to spread out your payments, or need other confidential financial arrangements, please be in touch with Rabbi Nemes. No child will be turned down from CHS due to lack of funds. 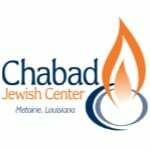 Rabbi Nemes can be reached at rabbi@jewishlouisiana.com or 504-957-4986. Volunteering for our Aleph Champ Hebrew Reading program. If yes, how often? Please let us know about other volunteer activities.